Summary: On the night Janie waits for her sister, Hannah, to be born, her grandmother tells her a story: Since the Japanese occupation of Korea, their family has lost a daughter in every generation, so Janie is charged with keeping Hannah safe. As time passes, Janie hears more stories, while facts remain unspoken. Her father tells tales about numbers, and in his stories everything works out. In her mother's stories, deer explode in fields, frogs bury their loved ones in the ocean, and girls jump from cliffs and fall like flowers into the sea. Within all these stories are warnings. Years later, when Hannah inexplicably cuts all ties and disappears, Janie embarks on a mission to find her sister and finally uncover the truth beneath her family's silence. To do so, she must confront their history, the reason for her parents' sudden move to America twenty years earlier, and ultimately her conflicted feelings toward her sister and her own role in the betrayal behind their estrangement. 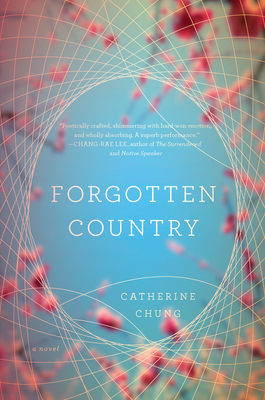 I'm always up for reading a book about another culture and that's what initially attracted me to FORGOTTEN COUNTRY by Catherine Chung. This novel deals with a dysfunctional family as well as both Korean and American cultures, and I was pretty sure that it would be right up my alley. To make things even more appealing, I had heard the author is an up-and-comer and has already been awarded some writing prizes. FORGOTTEN COUNTRY is a pretty ambitious novel and I'm having a hard time writing a summary that does justice to the complexities of this novel. I think it's probably best to read the publisher's summary (which does leave out some things that I probably would have mentioned in mine) and then let yourself be pleasantly surprised by this story. In a very quick (and admittedly lacking) summary, I would say that FORGOTTEN COUNTRY tells the story Janie, a woman who is struggling to come to terms with who she really is as well as her relationships with her family. She is resentful of her sister who just up and disappeared, but she is also conflicted by her role as daughter and as a Korean American. I think that Ms. Chung has done an amazing job with her debut novel. I was extremely impressed with her writing, and as I mentioned before, I thought she accomplished a great deal with the novel. Needless to say, I appreciated the prose and symbolism and how she tackled some very complex issues; however, I'm not sure that I loved this novel like I had hoped. I am clearly alone since this book has received starred reviews from Publishers Weekly, Kirkus Reviews, and Booklist. It's not that I didn't think this book was incredibly well done and worthy of all this praise. It's just that it didn't always resonate with me. In addition to Ms. Chung's writing style, so many other things about FORGOTTEN COUNTRY were incredibly well done. The story and the characters definitely got under my skin and I did find myself thinking about them for some time after completing this novel. Some parts of this novel were difficult for me to read as a daughter and a sister because the emotions they evoked were so real and made me a little bit uncomfortable. All that is good and all (who doesn't want a book to affect them?) but I thought the real beauty of this novel well the author juxtaposed so many things. For example, she showed the challenges with being an Korean and an American, as well as a staying loyal to your family and finding your own path (and there are quite a few more I could list!) But she also took this a step further when she wove into the story some Korean folklore. I liked how she balanced the characters' everyday lives with the folklore stories, and I thought it was an interesting way to introduce more about the Korean culture. FORGOTTEN COUNTRY would make a terrific book to discuss with friends. I wasn't able to find any formal discussion questions on the author or publisher's website; however, this book is full of discussion worthy topics. Some of the themes you might want to explore include family dynamics, parent/child relationships, sibling rivalry, loss, grief, the Korean versus American cultures, secrets, sacrifice, betrayal, loyalty, forgiveness and redemption. Despite not always resonating with me, I do think FORGOTTEN COUNTRY is an excellent book (and a stellar debut.) I highly recommend it! This sounds like it's well worth reading even if you didn't totally relate to Janie. Excellent review, today! This does sound well done and you're right, if a book doesn't get under your skin, what's the point. Glad you enjoyed this one. Love review -- so thoughtful. I got an ARC of this and am eager to start -- your comments and thoughts have seeded my brain and I'll be sure to pop back, post-read, to chat with you about this book! I know I mention this all the time, but it's so important for me to *like* a main character! Even if non-likability shows the author's skill! I just finished this one...and it's hard for me to say "I liked it"...there's so much complexity to this one...not a fast read at all and I think I'll still be mulling over this one for a while.